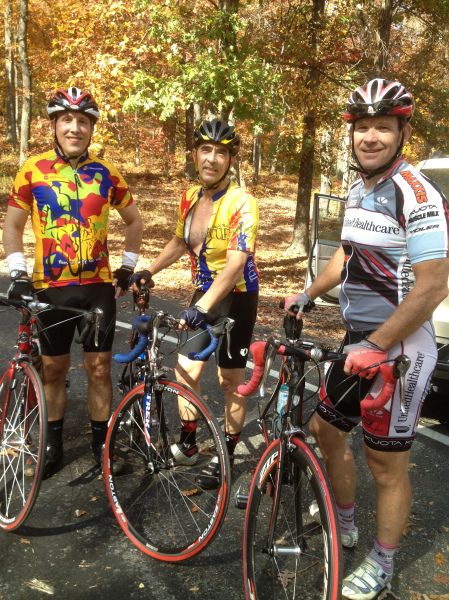 Yesterday, October 26th 2012, good friends, Mike Ribadeneyra (L) myself (C) and Mike Keeley (R) rode from Boiling Springs, (NC) to Columbus, North Carolina to climb Skyuka Mountain. My wife, Debbie took good care of us by being our support, driving the van, and picking us up at the top. The total ride was 50 miles, however, the final four miles, climbing up Skyuka Mountain was really tough. This mountain presented us with some beautiful sights, including colorful leaves floating down from the trees, waterfalls, and an incredible panoramic view of distant communities from the summit. Veteran Tour de France rider, George Hincapie would be having his 2012 Gran Fondo ride with over 1000 riders the following day (Saturday October 27th 2012) and would also be riding up Skyuka Mountain. Signs had already been posted along the way up the mountain, including that famous KOM (King of the mountain) sign at the summit. Hincapie rode along side of Lance Armstrong in all of his seven Tour de France wins. Former Tour de France winner, Cadel Evans would be riding in the Gran Fondo, as well as many other riders of the BMC Team. 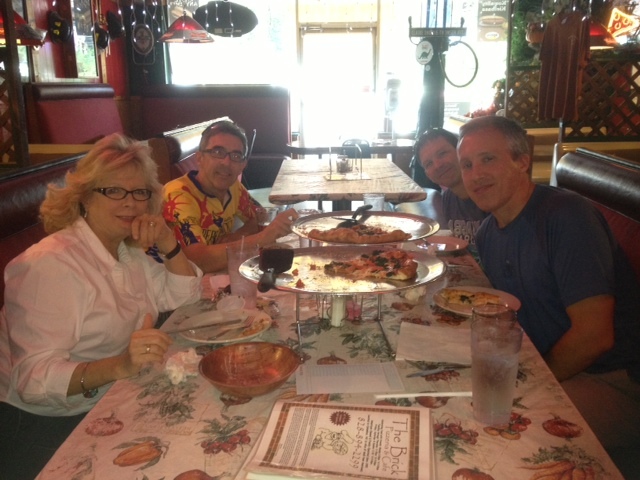 It was well worth all the pain of climbing Skyuka Mountain to be able to enjoy pizza at “The Brick Pizzeria” in downtown Columbus. Debbie volunteered to be our support and was essential to the success of the day. It was a fun day for sure…. This entry was posted on October 27, 2012 at 12:13 pm and is filed under Roger's Articles. You can subscribe via RSS 2.0 feed to this post's comments. Both comments and pings are currently closed.